Bob Edwards built a legacy of feeding children in our community through his tireless advocacy and fundraising through the Freestore Foodbank Rubber Duck Regatta. Bob joined the Freestore Foodbank Board of Trustees in 1995 and supported the organization in many capacities. He launched the Rubber Duck Regatta in 1995 and served as its chairman and cheerleader for 20 years. Bob grew the Duck Regatta into a million dollar event by continually seeking out and welcoming new ideas. 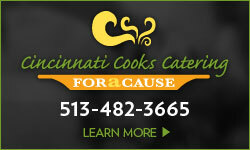 His passion and commitment over the course of two decades helped the event to generate 25 million meals for hungry children in the Tri-State area. We were deeply saddened when Bob passed away in the Fall of 2014. To activate the fund and encourage donations, the Freestore Foodbank Foundation made an initial investment of $10,000 and established a Matching Gift offer for $95,000 in donations that followed! 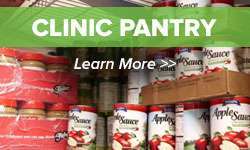 To date, the Fund currently stands at nearly $300,000 and we are exploring proposals for new childhood hunger programs that incorporate the “make it happen” spirit that Bob brought to the Freestore Foodbank. 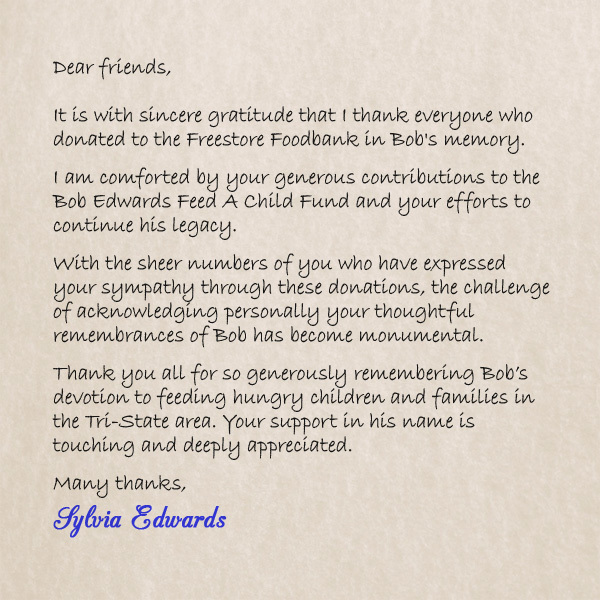 To make an online donation to the Bob Edwards Feed A Child Fund, please click here. 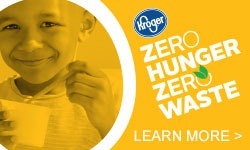 Kroger and P&G teamed up to honor late Rubber Duck Regatta Founder & Chair Bob Edwards. 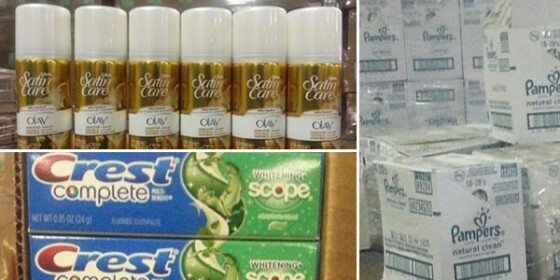 In January 2015, the companies donated health and hygiene products, valued at $75,000, in Bob’s memory. The products included: toothpaste, floss, deodorant, shampoo, shaving cream, baby wipes and feminine hygiene products. 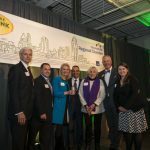 On Tuesday, January 6, 2015, the Freestore Foodbank unveiled the Bob Edwards Volunteer of the Year Award during our Annual Meeting & Distinguished Speaker Series. Bob was recognized by Feeding America in 2005 for being its “Volunteer of the Year,” so it seemed appropriate for the Freestore Foodbank to rename its Volunteer of the Year Award to recognize Bob’s commitment to our ongoing fight against hunger. Bill Dankworth, a past Board chair, was honored as the first recipient of the Bob Edwards Volunteer of the Year Award for his tireless contributions to our efforts. We were honored to have Bob’s wife, Sylvia Edwards, help present the award. On Thursday, January 28, 2016, we recognized our late founder Frank Gerson with the second ever Bob Edwards Volunteer of the Year Award. Frank’s wife, Connie, accepted the award on his behalf. 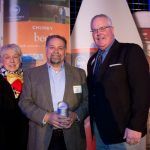 On Thursday, January 26, 2017, we recognized Fifth Third Bank with the third ever Bob Edwards Volunteer of the Year Award. Bob’s wife, Sylvia Edwards, helped us to present the award. We have shared many hugs, tears and memories at the Freestore Foodbank. Our hearts are shattered over the passing of Rubber Duck Regatta Founder and Chair Bob Edwards. 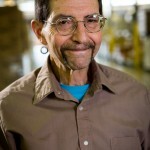 Bob was our friend, our mentor, one of our biggest cheerleaders, and most importantly, a member of our Freestore Foodbank family. Bob joined the Freestore Foodbank Board in 1995, after working with our organization through a food drive hosted by the Dan Beard Council Boy Scouts of America. In 1995, he helped the Freestore Foodbank launch the Rubber Duck Regatta after learning of a company called Great American Merchandising and Events (GAME). Bob lived and breathed “Duck,” 24 hours a day, seven days a week, 365 days a year. His time, his passion and his commitment for feeding children helped grow the Rubber Duck Regatta into our largest fundraising event. His heart was all about giving back. Aside from his work with the Freestore Foodbank, Bob was an active member of the Armstrong Chapel United Methodist Church and the Boy Scouts of America. In 2005, he received the “Feeding America Volunteer of the Year Award.” In 2010, he was honored with the “Jacqueline Kennedy Onassis Jefferson Award,” the Nobel Prize for public service. In 2011, Bob was added to Marietta College’s prestigious Hall of Honor. This past August, we celebrated a milestone year with the 20th Annual Rubber Duck Regatta. Bob had a goal – to raise $1 million, which would equate to three million meals for hungry children and families. With the support of a very generous community, and Bob at the helm, we reached that goal. Our thoughts are with Bob’s wife, two sons and two grandsons at this extremely difficult time. We are thankful for the years spent and the memories made with our dear friend. We will miss him deeply. Cincinnati is a much better place for having had Bob Edwards in it.